Thanks to everyone who commented on this post on your favorite books. We are going to try out The Pout Pout Fish and The Monster at the End of This Book. Sharing ideas amongst friends (even virtual friends) is a great play to start when choosing books for your child! Choosing quality books for kids can actually be difficult. Here are some things to consider when making book choices and some resources I enjoy. I hope this makes choosing books easier for you! Read Anything to your baby. A baby is calmed by the sound of your voice. I like to read when I nurse. Often I'll read aloud to my baby. With Logan I read the Book of Psalms from The Bible. The verse, "He will uphold you with his righteous right hand" got me through some long nights!! Nursery rhymes are a great idea for babies. They like repetition so if you only have one nursery rhyme book, read it over and over and over and over. A baby's vision is still developing. Transferring a 3D object onto a 2D page can make it difficult for a baby to distinguish what he is seeing. Try to choose books that have one large, very clear picture per page. When your baby starts teething, grabbing, etc. cloth books, bath time books, and chunky books are a good choice. I REALLY like this cloth book from my sister. It has a little wrist strap so Ty can't throw it down! There are also free booklists online. Sometimes it's hard to find book reviews that aren't "sponsored" by publishers. I think some of the best lists online are published by the International Reading Association. They have booklists chosen by teachers and children. Allow your child as much choice as possible when choosing books. Be prepared to read the same book over and over and over. The repetition is good for your child's brain! Start at any page, finish at any page. If you can get your kid to sit still for even part of a book, feel proud of yourself! Generate conversation as you read. You don't have to read the words on the page. Talking about the story is important too! Talking about book concepts is really important. Allow your child to handle the book. Tell him what he is doing, "Logan is opening the book, turning the pages, Where is the front of the book?" etc. Books about daily activities are a big hit at this age. Logan is very interested in a book about going on the potty. He's not so interested in going on the potty as he is the book! Lift the flap books are a good way to get a reluctant reader involved! The Read Aloud Handbook by Jim Trealease is a good place to start when choosing books for preschool children. And look at all this FREE information from Jim Trelease! Lots of brochures on what to read, what not to read, book reviews, etc! Check it out! The FREE online booklists from the IRA (listed above) have ideas for toddlers. This book list by NEA is good, too. However, it is just a list of books- no reviews! Again- allow your child to make choices about what to read, be prepared for repetition. Choose books based on topics or themes that interest your child. Allow your child to read to you when he can- But don't make it a quiz! Coax him to read something you know he CAN read! Generate conversations about the book: Again- not a quiz but a way to activate what your child knows about the book or how the book connects to real life. If you are looking for read alouds for early readers, I would recommend using The Read Aloud Handbook for these kiddos too... it goes all the way through middle school so it is a good resource to invest in. 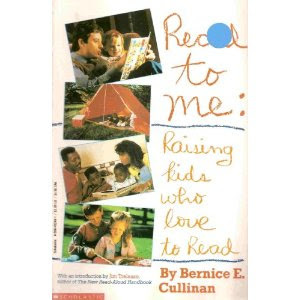 My favorite book for this age group is Read to Me: Raising Kids Who Love to Read. For each age group, this book includes ideas for reading AND writing with your child, tips for busy parents (that's all of us, right? ), and Surefire hits (book lists for each age). 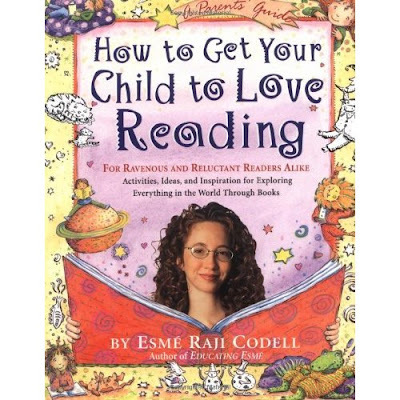 This book is very well organized and easy to use and it goes right up to age 11-12! A smart investment. FREE BOOKS- Ok, so I promised links to FREE and cheap books for your child but this post was getting very cluttered so later today (if the bambinos cooperate), I am going to post a separate article on Free books as well as information on making your own books for your child! Pray for long naps, people! Oh, yeah... and in the interest of Full Disclosure. Nobody is payin' me nothin'. Seriously. I make no money. I send my hubs off every day to do that. So these are just my thoughts and my reviews.